The best grapefruit juice is homemade grapefruit juice. Store-bought grapefruit juice with sugar and added preservatives is not healthy. Also, it has usually been brought to a high temperature to preserve it, which reduces its nutritional value. The best way to have a healthy glass of grapefruit juice full of health benefits is to make it yourself. You do not need a juicer. In fact, using a blender is better because a juicer removes the pulp, which is full of nutrients. 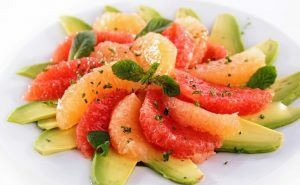 Some people add sugar to reduce the sourness of grapefruit but there are healthy alternatives to white sugar. 1. Peel the grapefruit rind off. 2. Cut grapefruit into quarters. 3. Put the grapefruit into the blender and blend. 4. Add one cup of cold water. 5. Add honey to reduce the juice’s bitterness. 6. Now blend at ‘Liquefy’ for one minute at high speed until mixture is thoroughly liquefied. 7. Serve in a tall glass. 8. Drink within 15 minutes so it doesn’t lose its vitamins. Delicious Winter Grapefruit Green Smoothie – Enjoy this delicious smoothie.